Hear that piano tune? Yup, it's a familiar song. And it means something pretty important. It's the last call. Yup, the bartender just let folks know that now's the time to grab your last drink, and right on cue, the piano man plays the first notes of the final song. But, you're not all that concerned with the last shot of whiskey. Nope, you're much more interested in getting one more dance in! You've spent the whole night in the saloon, dancing and having a grand ol' time, so naturally, you're going to want to enjoy your final dance of the evening. Find a partner, and get ready for a jaunt. You're a wild west lady, and you always like to have a good time! 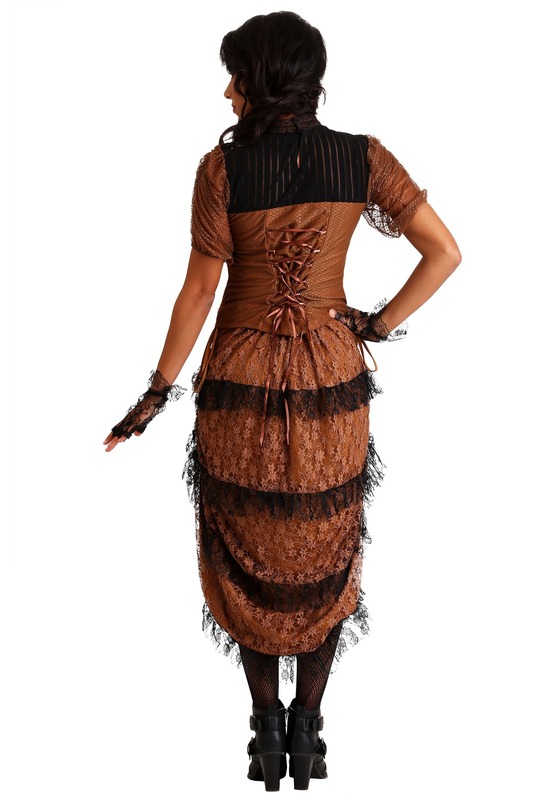 This Last Dance Saloon Girl Costume will transform you into an icon of the wild west. Are you ready to hit the Saloon? Slip on the dress ensemble, and you'll be ready for all the saloon fun you can handle! The Wild West really sounds like quite the adventure. So, are you ready to go all in? We say go for it! Of course, we might be biased since we always say go for good costumes times, but we don't think it's a fault to try to get the most out of your experience. And to us, that means getting your whole Halloween posse in on the costume fun. Shop for styles for all your friends and family, and you'll be one rootin' tootin' Wild West gang!